*These instructions are for the brands we offer including Howard Miller and Seiko Clocks. These may or may not work for other brands. We do not have any instructions for other brands outside of Howard Miller and Seiko clocks. Welcome to the world of radio controlled timekeeping technology. We hope you will enjoy the convenience of never having to set your clock again and the confidence of knowing exactly what time it is. • Press button to select a time zone. THAT’S IT! During the night your clock will automatically set itself. For a better understanding of how and why your clock works please continue reading. Nothing is more precisely measured than time! And nothing keeps track of time more precisely and trouble free than our radio controlled clocks. Since the beginning of time, man has been fascinated with the measurement of time and has devised more accurate machines to trap and measure time. Today, time is precisely measured in the United States by the most accurate clock in North America, the Atomic Clock of the US National Institute of Standards and Technology, Time and Frequency Division in Boulder, Colorado. A team of atomic physicists continually measures every second of every day to an accuracy of ten billionths of a second per day. These physicists have created an international standard, measuring a second as 9,192,631,770 vibrations of a Cesium 133 atom in a vacuum. This atomic clock regulates the WWVB radio transmitter located in Fort Collins, Colorado, where the exact time signal is continuously broadcast throughout the United States at 60 kHz to take advantage of stable long wave radio paths found in that frequency range. Radio waves at these low frequencies use the earth and the ionosphere as a wave-guide and follow the curvature of the earth for long distances. The built in antenna system will receive the WWVB signal anywhere in North America within 2000 miles of Fort Collins where long-wave radio reception is undisturbed. A microprocessor activates the receiver and processes the time signal from Fort Collins overnight. Through the radio signals, our radio controlled clocks always keep precise time. The changeover from standard time to daylight savings time, and vice versa, takes place automatically with the same precision. If you live in Indiana or Arizona you will wish to disable the DST function. After setting your clock press the small button labeled "DST" located just above and between the ET and CT Time Zone buttons on the back of the movement. Your clock will no longer observe DST. 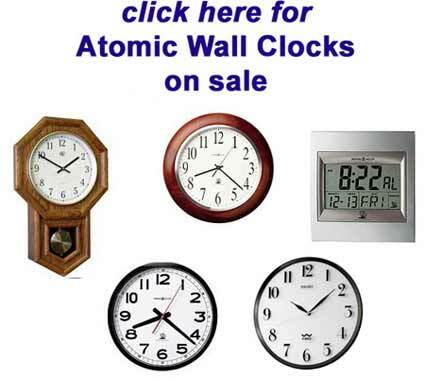 Atomic Clocks may also be set manually and be very accurate. Simply insert the battery, press your time zone and then press the flap just above the left side of the battery. Hold until you reach the correct time and then release. Your clock is now an accurate quartz clock until it will find the signal. 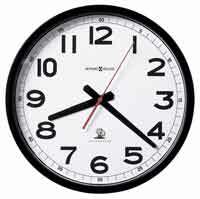 Your Atomic clock will still continue to look for the signal and start adjusting itself automatically. When the battery is installed the second hand will advance eight seconds (two seconds per step x four steps). The clock is now searching for a signal. For the initial setting it is recommended to stand the clock in an upright position near a window. Within five minutes the clock will either receive the WWVB signal and set itself to the exact time, or it will determine that the signal is not receivable at its current location and time of day. If a signal is not receivable it will fast-forward the hands to the 4, 8, or 12 o’clock position and search for WWVB each hour until a signal is received. If the time is manually set the clock will continue to periodically search for a signal and automatically reset the hands when the signal is received. Our Rwave, Atomic, Radio Controlled clocks do not receive or process radio controlled time signals from Germany’s DCF 77, Japan’s J Ga AS, or England’s MSFs atomically regulated transmitters. Our Radio Controlled clocks can be manually set and used anywhere. 1) Take out the battery and place the battery in backwards for about 10 seconds, then replace it again in the correct position. 2) Just after replacing the battery, press the Time Zone button for about 5 seconds on the back that corresponds with the time zone where you are located. 3) Shortly after the hands should start turning 20 times their normal speed and stop at 4:00 or 8:00 or 12:00. This means the clock is now looking or waiting for the signal and the clock movement is good. 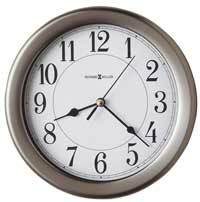 4) Place the clock near a westerly window overnight and then the clock should reset overnight and read the correct time. **If you had previously pushed the manual mode flap (switch), take a pen or paperclip and make sure it is pulled out in the off position. 1. Take the battery out of the clock. 2. Press the manual time setting tab on the back of the clock 15 times. 3. Put the battery back into the clock. 4. The clock will go to 4:00, 8:00, or 12:00 and stay there while waiting for the signal. 5. Immediately after your clock stops at 4:00, 8:00, or 12:00, push and hold the manual time set tab until you get to the correct time. If you release the button at the incorrect time, take the battery out and start again. These clocks will automatically continue to check and adjust after April 1. Battery - The clock must have a fresh battery to receive and process the time signal. Location - Try a different location, ideally near a window. It should be at least six feet from computers, TVs, air conditioners, other Radio-Controlled clocks and other electrical appliances that cause interference. The National Institute of Standards and Technology and WWVB encode a special DST "bit" in the WWVB transmission for DST. Your Radio Controlled clock will read this information and automatically advance the hands one hour in the spring and eleven hours in the fall. If you live in an area that does not recognize DST you must press the (unmarked) DST button for one second to deactivate your clock’s DST program. To reactivate the DST program simply press the DST button again for one second. where it can quickly receive a signal the battery can last much longer than one year. Q. Can a Radio Controlled clock be used outdoors? Q. Can the Radio Controlled clock be wired to control timing circuits? Q. Why does the second hand move only once every two seconds? A. When the battery drops below 1.25 volts the clock indicates that it is time to change the battery by advancing the second hand in two second steps. The operating voltage range is 1.25 to 1.75 volts.